Fox News is my favorite TV news channel and Megan Kelly is one of my favorite Fox reporters. Today I was startled to hear Trace Gallagher, another Fox News reporter say, on Megan’s show, that World War I is finally over and this is cause for celebration in Germany. He went on to say that the Treaty of Versailles was signed in 1919, and later he added that it was signed at the 11th hour on the 11th day of November, the 11th month. NO, NO, NO! That was the Armistice that was signed on November 11, 1918 to end World War I.
Revisionist historian David Irving has praised Adolf Hitler and described the Gestapo as “fabulous Policemen” during a controversial tour of Nazi death camps in Poland. David Irving’s tour of Poland was infiltrated by a spy who reported on the new crimes committed by Irving a couple of days ago, when he had the audacity to praise Hitler and the Gestapo policemen. This could mean more prison time for “Holocaust Denier David Irving,” as he is known in the mainstream media. The word Gestapo is an abbreviation of the words Geheime Staatspolizei which mean Secret State Police. The organization was formed by Hermann Goering, but it was put under the administration of Heinrich Himmler who was the Chief of German Police. How would David Irving know if the German policemen were fabulous or not? Well for one thing, Irving translated the memoirs of General Reinhard Gehlen into English. When I attended one of Irving’s lectures in 2009, this book was one of the books that he had for sale; the book was at least 4 inches thick. I wish now that I had purchased the book and had it autographed by Irving. Since Irving’s latest crime is all over the news, the value of this book has probably increased. I assumed that the younger generation has never heard of Reinhard Gehlen, who used to be known as Reinhard von Gehlen. I asked a young family member if he had ever heard of him. Of course, he had heard of Reinhard Gehlen, and he proceeded to tell me several anecdotes about him. One of the stories was that Reinhard Gehlen was dressed up in the uniform of an American General and sneaked into the United States shortly before World War II was over because America was so anxious to use his services in setting up the CIA. On September 20, 1945, Gehlen and three close associates were flown to the United States to begin work for them. Reinhard Gehlen was not the only German who was used as a secret agent by the United States, after the war. Klaus Barbie was also brought to America. 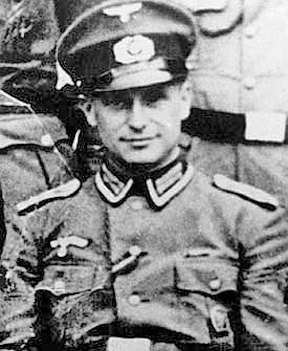 In 1947, Klaus Barbie, who is shown in the photo below, became an agent for the 66th Detachment of the U.S. Army Counter Intelligence Corps (CIC). David Irving undoubtedly knows the story of Horst Kopkow who became a British secret agent after the war. 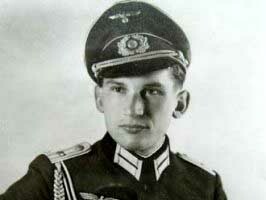 Kopkow was the senior counter intelligence officer with RSHA ( the Reich Security Head Office in Berlin). In 1946, Kopkow was in British custody; he was taken to England for interrogation in 1948, but as soon as he arrived, the British claimed that he was running a temperature. Two days later, it was announced that Kopkow had died from bronchial pneumonia before any information could be obtained from him. A death certificate was issued for him and information was released that he had been buried in the POW section of a Military Cemetery. But Kopkow was not dead. He had been recruited by the British to work for them. By 1948, the Allies had realized that the real enemy was the Communist Soviet Union. Kopkow had been “released from custody to work for British and American intelligence,” according to the book A Life in Secrets, by Sarah Helm. Kopkow’s death had been faked so that he could help the Allies in fighting the Cold War against the Soviets. These men were recruited by the Allies because they were “fabulous policemen.” They helped America and Great Britain win the Cold War against the Soviet Union. BTW, look at how skinny all three of the German men look in the photos above. They practically look like concentration camp prisoners. I’ve been following the news about David Irving’s nine-day tour of Holocaust sites and World War II historical sites in Poland, but I have been unable to find out if his tour group actually visited Auschwitz or not. The last news I read about his proposed tour of Auschwitz said that the authorities at the Auschwitz Museum were denying him the right to lead a tour because he is not a licensed tour guide. How long would it take to issue him a license? As a Catholic, I learned when I was a child that there are two ways to lie: You can tell an outright “bald-faced lie,” but if you withhold the truth, that is also a lie, which is a sin. A couple of days ago, I came across an article on the Southern Poverty Law Center web site, which you can read here. The article is about a very brave woman who wrote about what the tour guides at Auschwitz don’t tell you. I’ve been to Auschwitz twice, once with a guide, and once just wandering around by myself. So I know that there are many things the guides don’t tell you. This has become more important in recent years since, during certain times of the day, visitors to Auschwitz must be with a tour group. As this author can attest after two lengthy tours of Auschwitz and its adjoining Birkenau camp since 1988, the guides will tell you none of this. Perhaps that’s because it’s all false. 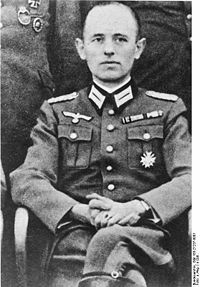 Long-time Auschwitz commandant Rudolf Hoess, in the autobiography he wrote shortly before his execution, described how Heinrich Himmler in 1941 “himself gave me the order to prepare installations at Auschwitz where mass exterminations could take place,” and then detailed the entire horrifying process, including gassings he personally witnessed. Filip Müller, a prisoner who worked for more than a year in the crematoria but survived, described unbelievably brutal exterminations. And so did thousands of others. The Southern Poverty Law Center article makes a good point: Maybe the guides don’t tell you certain things because what this lady is saying is false. However, the person who wrote this article makes a big mistake in taking the word of Rudolf Hoess and Filip Müller. Both made many mistakes about Auschwitz in their books and their testimony is not considered reliable today. So who is the pinhead and who is the patriot here? as Bill O’Reilly would say. You decide. Did the Nazis really use human skin to make handbags and purses? The charge of making handbags from human skin was made at the American Military Tribunal held at Dachau in November 1945, when Martin Gottfried Weiss, the former Commandant, and 39 others were prosecuted as war criminals. The star witness at these proceedings was Dr. Franz Blaha, a Communist who had been a prisoner in the Dachau concentration camp. Dr. Blaha testified that he had worked as a surgeon in the Dachau concentration camp, but after he said that he didn’t want to do any more operations, he was punished by being “sent to the death chamber where autopsies were performed.” Dr. Blaha claimed that he had performed “six to seven thousand autopsies” at Dachau. We took the skin from the chest and back, then used chemicals to treat the skin. Then the skins were placed outside in the sun and parts were cut for saddles, breeches, gloves, house slippers, ladies’ handbags. They were prepared and sent either to SS schools or given to some of the SS men. According to Dr. Blaha’s testimony, these items were made from human skin while a man named Bruno, and then Willy Mirkle, were in charge of the autopsies. Neither of these men were on trial and no items allegedly made from human skin were ever presented as evidence, nor was any forensic report introduced by the prosecution. Blaha’s testimony was corroborated by a confession obtained by Lt. Paul Guth from Dr. Wilhelm Witteler, one of the doctors at Dachau who was among the accused. Dr. Witteler testified that he had been forced to sign this confession, but Lt. Guth testified, under direct examination by the prosecutor, that no coercion had been used on any of the men that he had interrogated. A: During my interrogation I had to sit in front of the desk of Lt. Guth. A spotlight was turned on me which stood on the desk. Lt. Guth stood behind the spotlight and the interrogation started. “We know you, we have the necessary records about you…” I started to make an explanation. I was immediately stopped. I was yelled at. He called me a swine, criminal, liar, murderer, and that is the way the interrogation continued. I couldn’t give any explanations. I was only told to answer “yes” or “no”… I was interrupted immediately and told that all I had to do was answer “yes” and “no”. I couldn’t even explain it. I was told to shut up and to answer “yes” or “no”… since it was not like he thought it was, I had to get up and stand. So I stood up until 1:30 in the morning – seven hours. Q: … at the conclusion of the drafting of this statement you signed it? So now you know. It was proved at the American Military Tribunal at Dachau, by a signed confession, dictated by Lt. Guth, that handbags were made from human skin at Dachau. The gassing of prisoners at Dachau was not included in the charges against Martin Gottfried Weiss and the 39 others, but in spite of this, Dr. Franz Blaha was allowed to testify that the gas chamber at Dachau was used. Under the rules of the American Military Tribunal, any and all testimony was allowed, even if it had nothing to do with the charges or the men in the dock at Dachau. The reason that Weiss and the 39 others were not charged with gassing prisoners at Dachau was that the names of the gassed prisoners were unknown. Only crimes against Allied nationals were prosecuted at the American Military Tribunal, and since the names of the victims were unknown, there were no charges of gassing at Dachau. The American Military Tribunal did not make use of the ex-post-facto law known as Crimes Against Humanity, which included the crime of gassing prisoners. Why did the U.S. government deny that American flyers were held in Buchenwald? This post is in response to Peg, a reader who commented today on a previous post that I wrote about the American pilots who were held in the Buchenwald concentration camp during World War II. My uncle, Robert Ward from Boone, Iowa was one of the men that was taken to Buchenwald. He is no longer alive, he nearly died while being held, but did manage to survive. He broke his ankle when they had to jump from their airplane and was then forced to walk without ever being treated for his injury. The story of their captivity is an amazing, but terrible one. I am amazed that they lived to tell about it. He was definately a different man when he returned. For many many years even the American government denied that they were held in this camp. The things you learn on the Internet! In fact, what did we do before the Internet changed our lives? I got my first computer that had a modem for dial-up access to the Internet in 1993. In the first few weeks, I used up an entire ream of paper, printing out stuff that I had read. Then I realized that I didn’t have to print out everything I had read; it would be there forever, or at least for a long time. I just saw the first episode of Boardwalk Empire, the new HBO series about gangsters during Prohibition. Some of the characters are based on real life people like Al Capone. One of the characters is Arnold Rothstein who is shown in an unflattering way. He is suspected of cheating when he wins $93,000 at a casino and it is mentioned that he “allegedly” fixed the World Series game in 1919 and made a lot of money. Ford’s book is no longer in print and it is virtually unknown by the younger generation in America, but you can be sure the kids will be googling it. I am surprised that such a controversial book was shown in a TV show when it was not at all necessary for the plot.